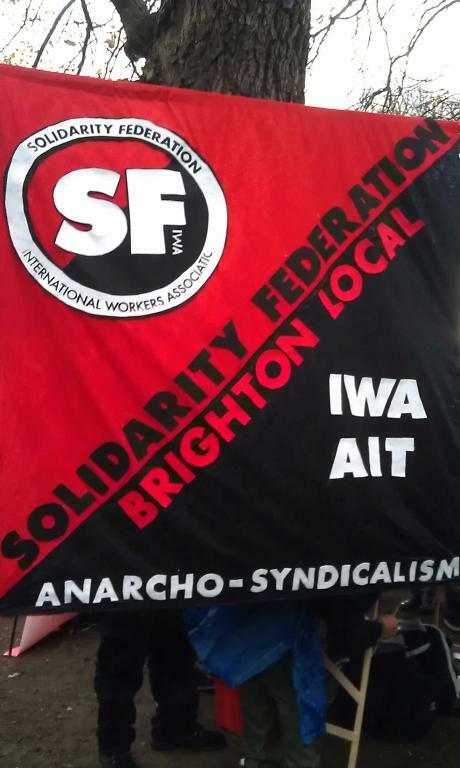 Translation of an interview by the Vienna Workers' Union with Brighton Hospitality Workers, an industrial section of Brighton Solidarity Federation, looking at the struggles they have organised and the lessons which working-class militants can learn from them. 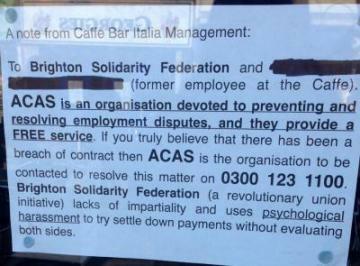 When did the Brighton Solidarity Federation form? How long have you guys been at it? Brighton SolFed was formed in 2007. How did you decide to focus on "hospitality"? Were there members who worked in that industry? We decided to focus on hospitality due to the number of workers in the industry who were approaching us with workplace issues. We soon became aware that many workers were unaware of their rights and that bosses were happy to exploit this, specifically migrant workers, and common issues included below minimum wage pay, wage theft, lack of written contract, uncertainty about ‘zero hours’ contracts, no holiday or sick pay, bullying & harassment. Brighton is the most visited holiday spot in the UK and hospitality is its second largest industry, plus a lot of people have moved here from London and elsewhere to take advantage of its reputation for a vibrant social life for those that can afford it. Prior to Brighton Hospitality Workers (BHW) we held workers’ rights stalls on Saturdays and visited workplaces, where many of the same issues were raised. We also started receiving enquiries from Spanish migrant workers, who had come to Brighton because of the economic situation there and the availability of low-paid hospitality jobs in the city. Migrants from Spain had formed an affinity group and many had experiences of workplace organising in Spain, including CNT-E membership, and so contacted SolFed. How many members are there? Are there members who offer support but are less active? Brighton SolFed’s membership fluctuates from 20 - 25 but not all are necessarily involved in BHW as its aim is to be a union for hospitality workers coordinated by hospitality workers, although BHW is coordinated by SolFed members and members not working in the hospitality industry are directly involved. Membership of the local is not a requirement to organising in BHW, and we have over 100 contacts on our email list and hold weekly meetings open to all. We also have a Health & Social Care network and coordinators for internal education, propaganda, social & industrial action, treasurer & membership, as well as a general coordinator. Brighton also holds the mandate for the SolFed federal secretary and for the federal website. So members are busy with their respective roles, although BHW has become the focus for a lot of the local’s activity and all members get involved when they can with stuff like meeting new contacts, drafting and delivering demand letters, forming pickets, flyposting and distributing propaganda. Over the course of the hospitality campaign, has your structure changed? Yes, we’ve developed more structure since we started, and the present structure has remained the same since our 2014 AGM – twice-weekly advice surgeries, weekly drop-ins & flyposting, Saturday stalls, email list, presentations, regular newsletter, as well as actions of course. Have you experienced real growth through the campaign? I mean, have more people joined than have left? Yes, more people have become members of the local as a direct result of BHW rather than have left, although numbers fluctuate due to the transitory nature of the work & living in Brighton. BHW has definitely raised the profile of Brighton SolFed across the city and elsewhere. How long did it take before the campaign really got going and people became aware of it? Did you guys have a deadline... how long you would try it before trying something else? When BHW was formed in October 2013 we held an open meeting at a social centre, where we now share an office, and publicised this widely across the city, particularly with a poster campaign in hospitality hotspots. We also combined our weekly Saturday stall with the campaign and publicised this as an opportunity for workers to approach us, as well as taking propaganda into local businesses and striking up conversations with workers. Our first meeting was attended by about 12 people, including SolFed members who worked in the industry and 2 coordinators, and we were encouraged by this. We agreed to hold monthly open meetings but were soon approached by a lot of workers as word started getting around, and so we decided to hold weekly open meetings to accommodate the demand. At these we give workers’ rights advice, discuss issues and organise disputes alongside the workers involved. Due to the numbers arriving at the weekly drop-is, and as we started getting results or encountered more complex issues, we decided to hold open meetings after the weekly drop-ins for workers and members to share experiences with others and look for collective solutions. This is a model that continues to the present, and we often have packed meetings. We never really set a deadline but, as past experience proved, we thought it would take at least 2-3 months before meetings were well attended or to receive regular contacts. Our first dispute was won in January 2014 when we issued a demand & leafleted a hotel who stole wages from a housekeeper who was also a SolFed member, so it got going almost immediately from there. Are there moments of doubt? We had a 4-month conflict at a café while the former worker returned to Spain which was difficult to sustain without the worker present, and we had to moderate the demand because of this, which was not really a moment of doubt but one of being aware of limitations - apart from this, no doubts. Do you work with other groups? What are/is your relationship(s) to other groups? We’ve been contacted by the IWW, who set up a Manchester Hospitality Workers. We’re regularly asked to give presentations or workshops at local events organised by anti-austerity groups and have given presentations at events organised by SolFed locals across the country at London and Belfast anarchist bookfairs. We’ve also given interviews to independent media..
Have any of the established TUC or independent unions reacted to your campaign? We were approached by reps from the largest service sector trade union, Unison, who, in partnership with other left-wing groups, wanted to emulate BHW with a propaganda campaign and by leafleting workplaces. After meeting them, we decided not to get involved as it seemed they were interested in workers joining their union before taking any action, and unlikely to result in any spontaneous direct action. What has worked easily? Where have there been difficulties? What has worked well is the format of meet worker / calculate amount owed / issue demand letter with worker / picket, leaflet & communications blockade if demand not met by deadline. We’ve succeeded in virtually every conflict and have so far supported workers to win back about £22,000 in total. However, there continue to be difficulties or challenges. The most significant of these is that most of the people who’ve approached us are former workers making wage theft claims after they’ve been fired or left the job. Not that this is a problem in itself, as the claims of former workers are no less important, but we are struggling to gain a foothold in workplaces by seeing workers collectively organise around terms & conditions. There are notable exceptions to this - there is a strong SolFed section in a hostel which has won a number of collective demands from management, and another SolFed section in a catering company which has been organising for some time, despite organisers being given written warnings and threatened with sackings. This relative lack of success in forming sections in multiple workplaces has a knock-on effect, in that it’s harder for individual workers to collectivise issues and, importantly, makes it difficult to confront bullying & harassment in the workplace, which is all-too-common, but hard to tackle from the outside. Another limitation has been the general inability to go beyond making lawful demands accorded by employment law & regulations, in other words, to reverse boss-worker relations in workplaces. Of course, supporting workers, or, more commonly, former workers, to win demands from management is a reversal of capitalist relations in that the workers are calling the shots and taking control of their circumstances, but we’d like to see more workplace militancy. There has been progress towards this in the 2 SolFed workplace sections mentioned above, but, again, the lack of a foothold in a number of workplaces, where workers can collectively tackle management on their own terms, is a challenge. What have you learned from that... has the campaign changed? At a review of BHW at our recent skills day, we discussed the lack of collective organising & militancy in workplaces, and the limitations of not going beyond making lawful demands. We came to the conclusion that it would be difficult for individual workers who approach us to take a more militant stand or go beyond lawful demands as this isn’t what they usually approach us for, and we would need to change our propaganda to reflect this. It would also place workers without collective support in their workplace in a precarious position. We agreed that, for now, workplace militancy is best promoted by SolFed members organising in their own workplaces, and, as mentioned above, we’ve made some progress towards a SolFed presence in workplaces. We always suggest to workers that they collectivise issues & demands in their own workplaces, or, if they are former workers, to contact any former colleagues in the hope that they get involved in campaigns. How has it been for members from other kinds of jobs to organize and campaign for the hospitality workers? As you suggest, workers, students and unemployed workers have got involved in the hospitality campaigns and actions, alongside hospitality workers. The abuses that hospitality workers experience are so blatant (and usually unlawful) that we believe most people would recognise and empathise with them. We’ve certainly seen this on BHW actions and at meetings. Also, we don’t draw the line at hospitality and support workers from any industry who approach us. To continue supporting workers to make successful demands, to get as many people involved as possible, to share out tasks more equally, and to raise our profile further. As discussed above, we are hoping to see more collectivisation in workplaces, and are working towards seeing more SolFed sections or members organising in their workplaces. In short, we’re working towards a greater degree of collectivity and militancy! When you have an action, a demonstration or a picket for example, what kinds of reactions do you get from passersby, the bosses, other workers? Passersby are generally supportive, especially when we explain the details of the case – we even get donations. In longer conflicts we’ve managed to get support from the community, with people regularly coming back to pickets to see if the worker has been paid or joining the picket line in some cases. Despite this, there have been confrontations when the boss of a business railroads their friends or ‘loyal customers’ into harassing us. In at least 2 conflicts it has been obvious that the boss has hired people to incite us to act aggressively in order to discredit us, but we’re not stupid enough to fall for this. We have a filmmaker contact available to film pickets when they escalate and there’s likely to be trouble form the boss and allies or police. In fact, bosses usually try to threaten workers or former workers rather than picketers, often because they have their personal details. We’ve had a lot of positive responses from other hospitality workers, many of whom have joined our email list once they’ve seen what we’re doing. Has there been repression from the police or the courts? The police have attended virtually every picket we’ve staged, usually called by the boss, but have not made any threats or arrests, and usually leave after 10 minutes. We’re aware that we can’t harass customers or prevent them from entering a business, and so are not breaking any law. The police could probably break up larger pickets on public order grounds but have not done so yet – they’ve also have been seen filming larger pickets but without further consequences so far. Bosses also often call the police when we enter premises with a worker to deliver demand letter, in which case we get out after handing the letter over. We’ve not been taken to court but have been threatened with this by bosses on several occasions, including a current conflict, and are aware that this is probably going to happen at some point. Can you describe a typical action? If deadline not met, we return to business with worker and 2 or 3 supporters going in to give boss a last chance to meet demand (or at least enter dialogue), while a potential picket waits outside with leaflets. Not all conflicts go according to the above, but it’s a standard process. We also have other forms of escalation at our disposal, such as broadening the conflict if possible to other locals or internationally, and other direct action tactics like ordering and leaving before food arrives (making sure customers are aware of the issue in the process), or even getting local media involved if likely to be sympathetic – during 2 of our longer conflicts we were approached several times by the local newspaper, but agreed that a press release would be preferential to an interview in which the journalist could twist our words or portray us negatively. Have other groups adopted your methods? Other SolFed locals are organising in workplaces & communities according to the same principles, and we travel to give presentations on this. We’ve also had interest from IWW, who’ve a Manchester Hospitality Workers, and we’re starting to get interest from other groups in UK & Europe, and are invited this year to give presentations in Belgrade, Brattislava & Vienna. We’ve also had interest from local grassroots trade unionists, who admire the direct action tactics, but this hasn’t produced anything meaningful in terms of a more radical trade union presence in non-unionised workplaces.